Currently Optimal Layout can only list tabs from Safari and Terminal. Support for Google Chrome's tabs have been removed due to the instability and poor performance it caused. I've also looked closely at tab support for Firefox, iTerm and many other apps but it's not currently viable as it relies on the developers of those apps adding support for it. A small number of applications don't display correctly or may not be positioned by Optimal Layout. This is an inherent limitation with the way these applications were developed. You can tell Optimal Layout to ignore applications by right clicking on the window name and selecting from the drop down menu. Optimal Layout is fully compatible with OS X Mavericks but must be granted permission to control your computer in the Security & Privacy System Preference. In the Privacy System Preference, click on the lock in the bottom left corner and enter your password. Next click on the checkbox beside Optimal Layout. 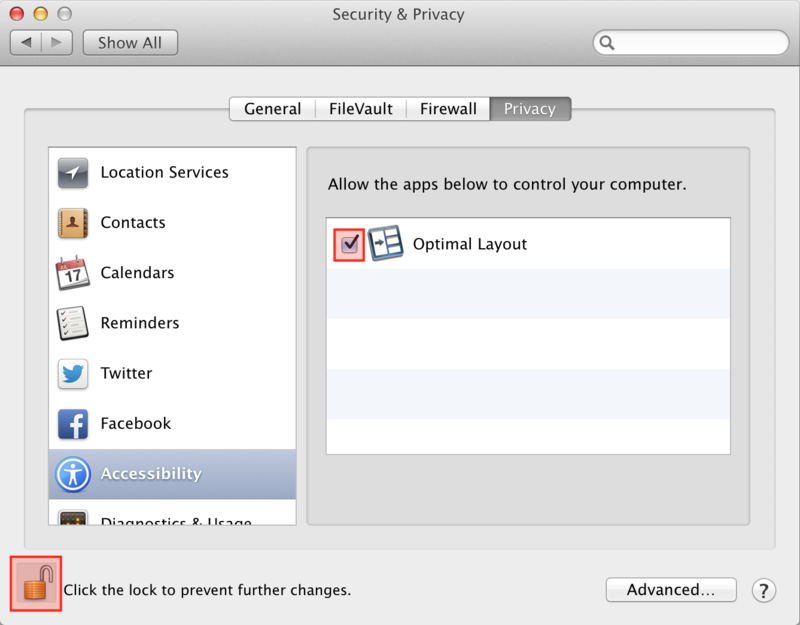 Then open Optimal Layout and add it to the Privacy preference again. OS X 10.6 Compatibility and earlier. You can download an older version of Optimal Layout which works with OS X 10.6 HERE. Optimal Layout is not available for earlier versions of OS X.
optioncontrolF Activate OL & begin searching the list of windows. You may like to customize this shortcut in Optimal Layout's Preferences. Release the option key and the highlighted window will be activated. You can replace the default command-tab application switcher in Preferences. option1-5 Position the highlighted window. The positions are displayed in the title bar. Use option-command-[1-5] as a shortcut to position a window when OL isn’t visible. optionS Save the highlighted window position. The shortcut can be global, so it works in other applications. optioncontrolarrow Move a window. This is a global shortcut, so can be used without activating OL. Something's gone wrong, how do I reset Optimal Layout? Open Optimal Layout's Preferences, select the General tab and and press the button in the bottom left corner "Reset All Preferences." Where ~ indicates your home folder. (It's possible only one of these files will exist, so just delete the one you find).